Joseph Wessling, a 44-year-old national sales manager at a high-end audio distribution company, was riding his bicycle with his fiancée at 8:30 a.m. on Oct. 7, 2012. The pair were riding in a bicycle lane in Aptos on Freedom Boulevard in Santa Cruz County. Wessling was traveling in front with his fiancée following him. As he was riding, he drew near to a manhole called MH749 that was located in the bicycle lane. The manhole cover was about three inches below the road’s grade. Wessling looked back at his fiancée and pointed down at the manhole to alert her of its presence. The manhole reduced the width of the bicycle lane to two feet, and Wessling was forced to swerve to get around it. When he did, he entered into the traffic lane and was struck by the side of a car. Wessling suffered significant injuries and filed a lawsuit against Pacific Bell Telephone Company, which owned the manhole cover; Santa Cruz County, which owned the street and was responsible for its maintenance; and Sandra Thomas, the driver of the vehicle that struck him. The plaintiff filed a lawsuit against Pacific Bell Telephone company under a theory of premises liability, against Santa Cruz County for having a dangerous condition on the public property, and against Sandra Thomas for negligence. He argued that the fact that the manhole cover was three inches beneath the grade of the road, it created a dangerous condition because it was located in the middle of a bicycle lane. He argued that Pacific Bell had a duty of care to maintain it at the same level as the road’s grade. Since the manhole cover was in the middle of a bicycle lane on a road that was maintained by Santa Cruz County, he also argued that it constituted a dangerous condition on public property. 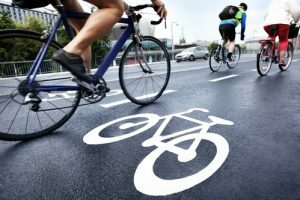 Finally, he argued that Sandra Thomas, the driver of the car, was negligent for driving too close to the bicycle lane when she was passing him. Wessling suffered multiple serious injuries, including a skull fracture, multiple rib fractures, a clavicle fracture and a scapula fracture. He also suffered severe brain trauma that resulted in the permanent and irreversible loss of brain tissue. Because of his injuries, he was forced to resign from his job and was only able to work part-time afterward. Pacific Bell admitted its negligence in maintaining the manhole cover. However, it argued that its negligence was not a substantial factor in causing Wessling’s accident. Instead, the company argued that Wessling swerved into the path of Thomas’s vehicle for an unknown reason three seconds after he passed the manhole cover. Santa Cruz County admitted that the bicycle lane in that location was dangerous but that the remainder of the bike lane was safe. Thomas argued that she was driving in the middle of her lane when Wessling suddenly turned into the side of her car, and she was unable to avoid the collision. Before trial, the plaintiff submitted a §998 demand of $1 million to Pacific Bell, $500,000 to Santa Cruz County, and $500,000 to Sandra Thomas. The defendants made §998 offers of $500,000 combined for Pacific Bell and Santa Cruz County and $50,000 from Sandra Thomas. The plaintiff and defendants were unable to reach a settlement before trial, so the case proceeded to a jury trial. The trial lasted for 20 days before both sides rested. The jury then deliberated for six hours before returning a verdict against Pacific Bell in favor of the plaintiff in the gross amount of $6,789,130.37. For the County of Santa Cruz and Sandra Thomas, the jury found in favor of the defendants. The jury found that Pacific Bell was 75 percent at fault and that Wessling was 25 percent at fault, which meant that the plaintiff’s net award was $5,091,847.78. Following the trial, a number of post-judgment motions were filed. The sides agreed to settle for $4 million so that the plaintiff could avoid an appeal by Pacific Bell. In this case, the jury found that the County of Santa Cruz had not received any notice about the dangerous manhole in the bicycle path. However, Pacific Bell admitted that it was negligent in maintaining the manhole and that it owned it. While the company argued that the manhole did not substantially contribute to Wessling’s accident, the jury found that it did. The jury found that he swerved because he turned back to warn his fiancee about the condition, meaning that the manhole’s dangerous condition did substantially contribute to the cause of his accident. As this case demonstrates, proving liability in a premises liability case can be difficult. It may take expert testimony and substantial investigation in order to build a strong case. If you have been injured in an accident while you were on the property of another, you may benefit by getting help from an experienced personal injury attorney. Contact us today to schedule your free consultation.